Ever since production started on Rampage, star Dwayne Johnson has not been shy about sharing set photos with his fans, offering our first look at the actor who plays George the Ape in motion capture, along with his co-stars Naomie Harris and Jeffrey Dean Morgan. 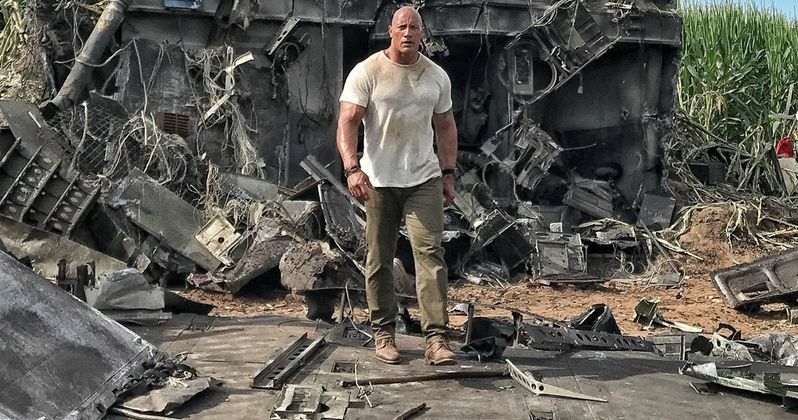 Today we have two more photos from the set, one which showcases some of the epic destruction left in the wake of these three creatures, and another where Dwayne Johnson is trying to protect Naomie Harris. Here's what the actor had to say about his Naomie Harris photo on Instagram, explaining why he's grabbing the actress' thigh. "Thigh grab was unplanned, but instinctual since I'm in protect mode. Intense week for me and my partner in survival, Naomie Harris. Total destruction and chaos caused by the three gigantic rampaging beasts putting us in constant "fight or flight" mode. Lucky SOB to have such a spectacular actress by my side puttin' in this level of intense emotion daily. If you haven't seen Moonlight yet, check it out and you'll see why her powerful performance was nominated for an Oscar. Until then, we'll keep dancing at this party in hell. And we'll see you there. #LetsDance #Rampage 4-20-2018." The actor was less forthcoming on Instagram about the second photo, where his character Davis Okoye is seen standing in the midst of a facility which seemingly housed these creatures. It seems likely that this facility is where these experiments took place, where George the ape, Lizzie the reptile and Ralph the werewolf were transformed from normal animals into gigantic mutated beasts that will go on to terrorize major cities all across the country. Here's what Dwayne Johnson had to say about this image in a much more succinct statement. "We have a problem. The beasts survived. Their blood and tracks headed cross country..."
It's possible that this is actually a line of dialogue said by either Dwayne Johnson's Davis Okoye, or possibly by the villainous character played by Malin Akerman, who runs the corporation that conducted these experiments which went awry. Or, it could just be simply Dwayne Johnson interpreting this shot in his own way. Shooting has been under way for almost exactly two months in Atlanta, and while it remains unclear how much filming is left, Dwayne Johnson seems to attract hordes of fans everywhere he goes, as evidenced in two new videos the actor also shared on Instagram. One of the videos showcases Dwayne Johnson signing the back of a young fan's shirt, while pulling a bit of a prank on the youngster, pretending to sign the back of this boy's head with a Sharpie. The actor's "evil sense of humor," as he describes it on Instagram, is also on display in the second video, where he drives up to a group of fans waiting to meet him just outside of the set, and pretends to drive off, which causes a mild uproar, before he goes back to greet them. Take a look at these new Rampage photos and videos featuring The Rock and Naomie Harris.